The “Platforms allowing Executives to share Information with Executive Recruiters” niche is pretty specialist. There are lots of job boards that host CVs for executives, but platforms that allow executives to share private information with executive recruiters are few and far between. The market leader for much of the last decade has been Bluesteps, a product owned by the Association of Executive Search Consultants and used exclusively by its member firms. Leadership is, of course, hard to define. It’s even harder to measure when those who compete for the title tend to keep the important KPIs – which relate to the number of executives registered, the number of recruiters using the platform and, most importantly, the level of engagement between the two – largely confidential. However, there are certain metrics for which independent data – albeit only high-quality estimates – are available. One such set of data is the number of visitors to a site and, far more importantly, what they do when they visit. The primary source of this type of data is Alexa Insights, the Amazon subsidiary. 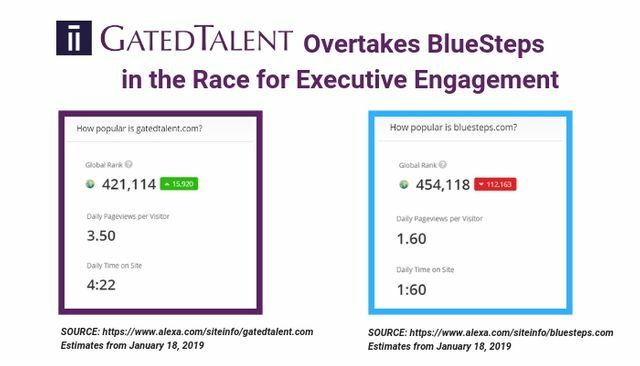 We were delighted to note that – as at January 18, 2019 - GatedTalent ranks more highly than Bluesteps in terms of both total site visitors according to Alexa. Far more importantly, the level of engagement among GatedTalent visitors is twice that seen by visitors to Bluesteps – visitors to our service visit more than twice as many pages and spend more than twice as much time on the site as visitors to our rival do. At the end of the day, site visitors is not what it’s all about for us. It’s a niche market and we do not plan to compete with the mega job boards of the world – we are focussed at the top end of the market. What really matters is our internal metrics which show continued growth in executive profiles, in recruiter users and in engagement between the two. To support these aims, we continue to invest in the experience of our users – in the last fortnight, we’ve updated our home page, improved our onboarding experience for new members, improved the search experience for clients, and hired a new team member to support our members in the US. We are very proud of what we’ve achieved in the past year and are equally excited about the future. As always, we welcome new executives to register with us, and recruiters to contact us to learn more!